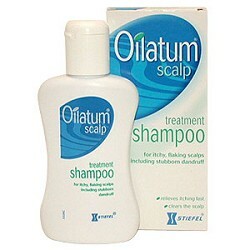 Oilatum scalp treatment shampoo smells like plain soap. It doesn't lather very well, and doesn't feel creamy or luxurious on your scalp. The packaging doesn't leave you feeling inspired and they certainly don't have ad campaigns featuring gorgeous semi naked women going 'ooh' in the shower. And it's not cheap either. However, it doesn't irritate my skin or scalp. Hallelujah! I have been using the Oilatum scalpt treatment shampoo, no conditioner, for a while now and it's been ok. The only issue is that you're supposed to leave it on your scalp for a few minutes before you wash it off, which when you're trying to keep your showers as brief as possible, and when your showers are on the chilly side, is not a good thing! Having said that it's done me right. I am coming to the end of the (very small) bottle now though, and I have picked up a new shampoo in Holland and Barrett, so I might try that next.